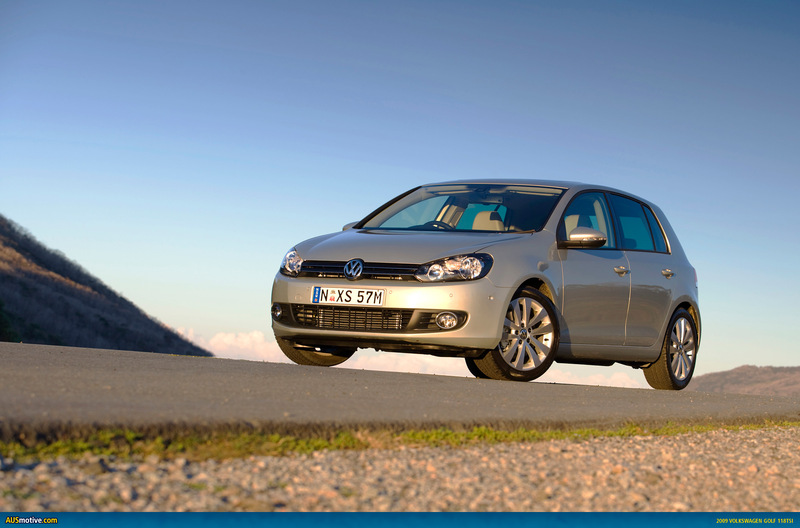 The Volkswagen Golf VI has been named World Car of the Year for 2009. The announcement was made overnight at the New York International Auto Show. After making the final cut, the Golf had to beat the Ford Fiesta and the Toyota iQ to claim the 2009 World Car of the Year title. “We are honored that our new sixth generation Golf was named World Car of the Year. The Golf is Volkswagen’s best selling nameplate with more than 26 million units sold in over 120 countries,” said Stefan Jacoby, President/CEO, Volkswagen Group of America. Full details available below in press releases from Volkswagen and WCOTY. At a press conference hosted by the New York International Auto Show and Mobil 1 at the Jacob Javits Centre in Manhattan, New York, the Volkswagen Golf VI was declared the 2009 World Car of the Year. The Volkswagen Golf VI was chosen from an initial entry list of fifty-one (51) entries nominated by fifty-nine (59) World Car jurors from twenty-five (25) countries throughout the world. Each juror was appointed by the World Car Steering Committee on the basis of his or her expertise, experience, credibility, and influence. Each juror typically drives and evaluates new vehicles on a regular basis as part of their on-going full-time professional work. Through their respective outlets they collectively reach an audience of many millions world-wide. The jurors voted in January 2009 to establish a top ten shortlist. A second round of voting occurred in February when jurors were asked to score the top ten candidates based on merit, value, safety, environment, significance and emotional appeal. The World Car of the Year was chosen from those top ten finalists as tabulated by the international accounting firm KPMG. The top three contenders for 2009 World Car of the Year title were the Ford Fiesta, the Toyota iQ and the Volkswagen VI. “We are honored that our new sixth generation Golf was named World Car of the Year.” said Stefan Jacoby, President/CEO, Volkswagen Group of America. “The Golf is an iconic nameplate for the Volkswagen Brand and is known throughout the world. The Golf is Volkswagen’s best selling nameplate with more than 26 million units sold in over 120 countries.” added Jacoby. Previous World Car of the Year winners were the Mazda2 / Mazda Demio in 2008, the Lexus LS460 in 2007, the BMW 3-Series in 2006, and the Audi A6 in 2005. Now in their sixth year, the annual World Car awards have become one of the world’s most prestigious, credible and significant programs of its kind. 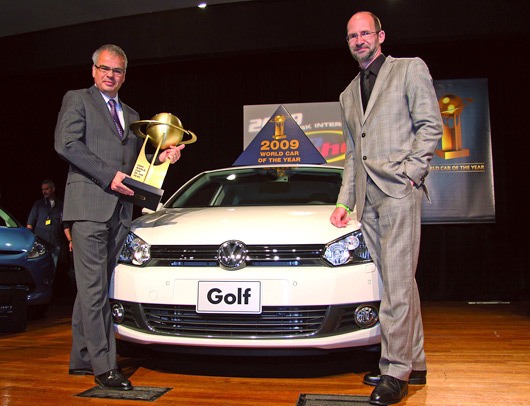 NEW YORK, April 9, 2009 — The Volkswagen Golf was honoured as the 2009 World Car of the Year. A jury comprised of fifty-nine international automotive journalists from twenty-five countries around the world chose this year’s World Car of the Year, which was announced this morning at a news conference during the New York International Auto Show. The Golf, a perennial favourite in the Volkswagen line-up, has sold more than 26 million units in 120 countries, making it one of the top selling vehicles of all-time. The new sixth generation Golf first debuted at the Paris Motor Show last autumn, and made its U.S. debut at this year’s New York International Auto Show. The Golf has been designed to be quieter, sportier, fuel efficient and present a clean, distinctive appearance that – staying true to Volkswagen – is fun-to-drive. The new Golf embodies Volkswagen’s product strategy aimed to sharpen the brand design in all classes and apply greater global consistency among model names. These steps are intended to leverage the offerings of the world’s third largest automaker as it looks to increase sales and market share. 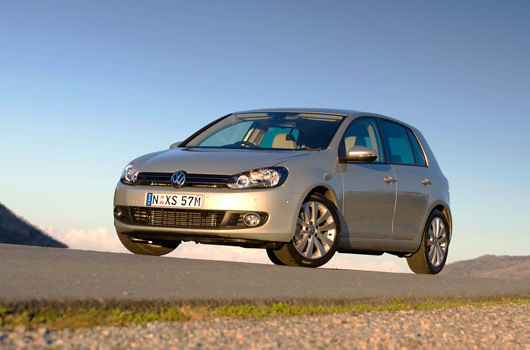 The 2010 Golf will be available in dealer showrooms across the U.S. this fall in gasoline and TDI versions.